New York City principals are getting tougher: They denied tenure or continued the probation of a record 11% of teachers in the school year just ended, according to Department of Education data released Thursday. Five years ago, less than 1% of teachers found themselves in the same predicament. Principals this year also gave hundreds more teachers “unsatisfactory” ratings. The results come amid a push by schools chancellor Joel Klein for greater teacher accountability and a harder stance on tenure. In a letter to teachers in February, he said tenure had become “an expectation more than an honor.” He had also called on principals for the first time to consider student test scores when making tenure decisions, and the latest results show that they did. In a recent poll a majority of Americans said they thought Barack Obama, president, was a socialist. It is safe to say that America’s teachers were not among them. At the annual convention earlier this month of the National Education Association, America’s largest teachers’ union, the body’s president accused Mr Obama and Arne Duncan, his high-profile education secretary, of spearheading the most “anti-educator, anti-union and anti-student” administration he could recall. To a degree that almost nobody anticipated 19 months ago, Mr Obama, who will on Thursday give a set piece address in Washington on education reform, has alienated the largest single historical provider of cash and volunteers to the Democratic party – namely the teachers’ unions. Yet Mr Obama’s reforms, which have been taking place at the state level and often in the teeth of union opposition, have brought about what even critics concede is the most rapid school reforms America has seen in a generation. “You do not interest me. No man can say these words to another without committing a cruelty and offending against justice,” writes philosopher Simone Weil. To turn a deaf ear is an offence not only to the ignored person but also to thinking, justice and ethics. Coleridge’s Ancient Mariner is cursed because no one will listen to his story. The Italian chemist-turned-writer Primo Levi was preoccupied with this fable because of his fear that on returning from Auschwitz people like him would be either ignored or simply disbelieved. Regardless, listening gets a very mixed press amongst critics and intellectuals. There is a suspicion of “wistful optimism” or the quasi-religious appeal to “hold hands” and play priest at the confessional. These qualms miss the centrality of listening to a radical humanism which recognises that dialogue is not merely about consensus or agreement but engagement and criticism. This is something that Primo Levi understood. A new study finds that babies raised by working mothers don’t necessarily suffer cognitive setbacks, an encouraging finding that follows a raft of previous reports suggesting that women with infants were wiser to stay home. Researchers at Columbia University say they are among the first to measure the full effect of maternal employment on child development — not just the potential harm caused by a mother’s absence from the home, but the prospective benefits that come with her job, including higher family income and better child care. “This transformation is both essential and urgent if we are to accelerate achievement for all children and accomplish the goals of Imagine 2014,” she said in a statement, referring to the district’s five-year improvement plan. Regional office facilities, which generally served as buffers between schools and the central office, will reopen this fall as parent- and family-resource centers designed to provide support services for parents. Along with the changes to the regional offices, Ackerman has appointed three associate superintendents. Tomas Hanna, Ackerman’s former chief of staff who was recently given the job of associate superintendent of academics, will serve as the associate superintendent of academic support. David Weiner, former chief of accountability, will become the associate superintendent of academics and curriculum. A South Florida superintendent has been graded on his performance during the past school year. The Broward County School Board gave Broward Schools Superintendent James Notter a grade of “C” in his annual evaluation, Wednesday morning. Notter received a 7.7 on a 10-point scale for his performance, an average grade for the year. According to the school board, Notter needs to improve his communication with staff members and the general public; improve relations with the teachers union in Broward and cut administrative costs. “With all the complications we went through, I believe it is a fair and valid assessment of how the superintendent worked with the board, worked with his leadership team to do the right thing for our children,” said Notter. Mike Ritzius works with students at the Integrated Studies Program, a project-based pilot program inside the Camden County Technical School, in New Jersey. Students work to master state content with the help of teacher-advisors and project-management applications, primarily Project Foundry. Chad: Would you please describe your school for us? Mike: The Integrated Studies Program (ISP) is a pilot at Camden County Technical School (CCTS). The school as a whole is a county-wide technical school, serving 32 sending districts with the largest being the city of Camden, NJ. The majority of the students come from challenging socio-economic situations, making the entire school eligible for Title 1 funds. Students choose to come to CCTS to pursue a trade but recently, the district has been adding more professionally minded career areas. As a whole, the district delivers content through very traditional means. The ISP approach is 180 degrees different from the rest of the school. The program was piloted in the 2009-2010 school year with five advisors and 100 students, now down to 87. The attrition rate for the rest of the district is 27% due mostly to the high mobility of the student body and the rigorous demands of CCTS as a whole when compared to the larger sending districts. And now Bronson has turned his fertile imagination to the act of creativity itself. In a Newsweek cover story early this month, Bronson and his co-author Merryman write about the crisis of creativity now affecting American schools and children. According to Bronson, the results of creativity tests for American kids has been falling since 1990 – a particularly worrying statistic given that these test scores have been rising over the past twenty years in most other industrialized countries around the world. So it was a real honor to have Po come into the Techcrunch.TV studio last week to talk about Silicon Valley creativity, its role in the broader economy, his own creativity and why, exactly, there’s a creativity crisis today in American schools. This may be the single most important issue facing not only the American economy, but also our culture and society. And there are few, if any, writers around today who can discuss creativity with the same erudition, imagination and wit as Po Bronson. I write for the executive committee of the Clinical Legal Education Association (CLEA) to express our concerns regarding the document entitled “Draft, Security of Position, Academic Freedom, and Attract and Retain Faculty” dated July 15, 2010, which was posted on the web site of the Standards Review Committee on July 20, only three days in advance of the Committee’s meeting to begin to discuss the issues it raises. This “Draft” proposes the elimination of the longstanding provisions in Standard 405 addressing tenure and other forms of security of position for law faculty. Democratic gubernatorial nominee Jerry Brown unveiled an education reform plan Wednesday that calls for a wholesale restructuring of California’s public school system, from changing the way schools are funded to revamping the state’s higher education system. The eight-page plan touches upon the major issues facing the state’s education system, from the increasing cost of college to the state’s dismal dropout rate. Some of the proposals, such as changing the way schools are funded, would take years. Brown urged patience. McGill University’s medical school may have an Ivy League reputation, but it no longer has something that most of the top medical schools on the continent do -a requirement for all students to write the Medical College Admission Test. Beginning this month, Canadian students who studied at a Canadian university before applying to McGill medical school will no longer be required to write the MCAT -the widely used admissions test that measures students in physical sciences, verbal reasoning, biological sciences and a written sample. Students typically spend about three months studying for the exam. In making the decision, McGill is aligning itself with francophone or bilingual universities here and elsewhere in Canada that also don’t require the MCAT because the test has no French equivalent. Students from outside the country will still have to write the MCAT. Mystery, Drama, Deception in Alabama Is the state’s biggest teacher’s union behind a so-called “conservative” group? The big question in the final days of Alabama’s runoff election for the GOP gubernatorial nomination isn’t just who is going to win the tight race between Bradley Byrne and Robert Bentley. It’s the mystery of who’s behind a largely bogus TV ad attacking Byrne. A group calling itself the “Conservative Coalition for Alabama” is airing an ad that falsely accuses Byrne of a host of offenses. It says Byrne “took a 500 percent pay raise” (that’s misleading); steered government contracts to “cronies” (there’s no evidence of that); lost millions of dollars in the state’s prepaid college savings plan (so did nearly all other state plans); and ran up the taxpayers’ tab drinking “expensive wines” (false) and traveling in “style” (not entirely true). Byrne suspects that the Conservative Coalition is a front group for the Alabama Education Association. He has good reason. AEA Executive Director Paul Hubbert (who also is co-chairman of the state Democratic party) admitted that he used “True Republican PAC” as a front group to attack Byrne during the June 1 primary fight. It’s true, in a sense, that all that happened Wednesday was the state reported test scores using a higher cut-score. It was just like they’d moved the goalpost further down the field, one Buffalo educator (and apparent football fan) explained. More kids failed because they graded the tests harder. But a lot more happened than that. As State Education Commissioner David Steiner explained at the state’s press conference, the state tests have not simply become too easy. They have become bad tests. They have been assessing only a very narrow band of state standards and virtually ignoring the rest of the state curriculum. They have repeated questions from year to year, making it easy to game the tests. And they do not reflect what students need to succeed in college and careers. That is going to change. Over the next three years, the tests will become longer. They will test more material, have more open-ended questions and require more writing. They will aim to assess not whether students learned “test-taking tricks,” in Steiner’s words, but whether they can apply knowledge and explain their answers. By 2014-15 the goal is that our state tests will be able to tell students honestly if they are on track to succeed in college and beyond. Students in Sun Prairie are preparing to enter a new state-of-the-art high school this year, but some residents of the city are upset with the amount their taxes could go up. There’s no doubt Sun Prairie has been growing. School district enrollment has gone from nearly 4,800 to almost 6,800 in 10 years, WISC-TV reported. Now, the district has a high school to fit those students, but the taxpayers will be footing the bill. Teacher Scott Kloehn’s chemistry room just got a lot more high-tech with one of the many interactive whiteboards that are now in every Sun Prairie High School classroom. “My job is to educate my kids the best way possible with the best means possible, and if that means using the technology in my room that I’ll have easy access to, it’s certainly what, as a good teacher, I’m going to go ahead and do,” said Kloehn. I received some interesting news recently from two Washington area high schools, Washington-Lee in Arlington County and the Friendship Collegiate Academy in the District. W-L, as it is often called, is a regular public school. Friendship is a public charter school. About 34 percent of the W-L students are low-income. That figure is twice as high, 70 percent, at Friendship. W-L graduates about 400 seniors a year, Friendship about 250. They both have dedicated teachers and ambitious programs to give as many students as possible exposure to college-level courses. W-L has both Advanced Placement and International Baccalaureate courses. Friendship also has AP, plus access to a significant number of University of Maryland and University of District of Columbia courses. Friendship has fewer affluent, college-educated families than W-L does. (Arlington, where W-L is, has just been declared by the Brookings Institution as having the largest portion of adults with bachelor’s degrees, 68 percent, of any U.S. county.) Friendship students mostly come from D.C. schools with standards not as high as those in Arlington. So they start high school, on average, at a lower level. Barack Obama on Thursday said education was “the economic issue of our time”, linking America’s declining public schools with its struggles to remain competitive. Pointing out that America has been dropping steadily down the international league tables, particularly in mathematics and the sciences, Mr Obama made a coded plea for America’s teachers’ unions to comply with the controversial “Race to the Top” reforms he is pushing. The president’s address comes amid a growing restlessness among ordinary Americans, who tell pollsters they fear the recovery from the recession will fail to create the high-paying jobs to which people were accustomed in earlier decades. Mr Obama’s economic advisers concede it will take years to build “new foundations” for the American middle class who were suffering their own “personal recessions” – in terms of stagnant or declining incomes – way before the 2008 financial meltdown. Budget/Financing, Community Partners, Lifelong Learning, Nutrition, Parenting, School Climate, What Can I Do? Are Lunch Ladies Part of Recipe for Good Schools? In Chicago, dozens of lunch ladies are leaving the schools they’ve worked at–sometimes for years. That’s because those schools are being “turned around”–a strategy that involves removing the entire staff at failing schools to “reset” the culture there. It’s a strategy Education Secretary Arne Duncan is now pushing nationwide. But a question is: Is it necessary to remove lunch ladies, janitors, and security guards to create better schools? In mid-June, the lunch ladies at Deneen Elementary School on the city’s south side were serving up one of their last meals. LUNCH LADY: How are you? What do you want? Carrots or salad? Fewer than half of kids meet standards here on state tests, so Deneen is being forced to start over. As a “turnaround,” every adult has to leave, from the principal to the teachers to the seven lunch ladies. Veronica Fluth was Deneen’s cook. After insisting I put on a hair net, she gave me a tour of her spotless kitchen. A state appeals court strengthened the authority of local school boards over charter schools Monday by making it harder for California education officials to approve statewide charters with campuses in multiple counties. Charter schools are publicly funded and tuition-free but operate independently of local school districts and their union contracts, though districts are supposed to monitor their performance. They have been proliferating both in California and nationwide. State law allows the state Board of Education, appointed by the governor, to let a company establish charter schools in far-flung counties without local approval or monitoring. Groups of school boards, administrators and teachers claimed the board was overstepping its authority, and on Monday, the First District Court of Appeal in San Francisco agreed. The University of Wisconsin-Milwaukee Student Association is grumbling about the decision to send the school’s basketball players, staff and some guests on a trip to Italy next month. The association – the same organization that backed a $25 per student per semester fee to raise money to renovate the Klotsche Center or build a new arena – argues this is no time to be heading overseas while the Athletic Department has a deficit as high as $8 million. The trip is expected to cost $160,000. “The fact that the UWM Athletics Department continues to spend outside of its means is troubling. The department simply cannot afford to go on such an extravagant trip regardless of where the money is from,” said Travis Romero-Boeck, president of the Student Association. In August 1818, Thomas Jefferson authored a report for the Virginia Legislature that laid out the topics to be included in the curriculum of his newly founded University of Virginia. Like so many foundational documents, Jefferson’s report resonated with such clear and specific language that it serves to this day as an accurate summation of his educational vision — and a blueprint upon which his intellectual heirs may continue to build. Massachusetts, like Virginia, is among the great pioneers in American education, from Colonial times to the present. But last week’s decision by the state Board of Education to adopt national Common Core standards is an object lesson in how not to pursue education reform. It’s stuff that would have driven Jefferson to laughter or scorn, and should provoke nothing less among Massachusetts taxpayers. What was approved, and how, make clear that this state’s educational leaders need refresher courses in the pursuit of educational excellence. They see life as a game. They enjoy nothing more than outsmarting the system. They don’t trust politicians, medias, nor brands. They see corporations as inefficient and plagued by an outmoded hierarchy. Even if they harbor little hope of doing better than their parents, they don’t see themselves as unhappy. They belong to a group — several, actually — they trust and rely upon. “They”, are the Digital Natives. Erasing years of academic progress, state education officials on Wednesday acknowledged that hundreds of thousands of children had been misled into believing they were proficient in English and math, when in fact they were not. The bar for what it means to be “proficient” has now been set substantially higher. For instance, last year more than 77% of New York state students in grades three through eight reached proficiency in state English exams. Under the new standards, only 53% were considered proficient this year. The difference amounts to nearly 300,000 students across the state. “We are facing the hard truth that the gains in the past were simply not as advertised,” said Merryl Tisch, the chancellor of the state Board of Regents, during a news conference announcing the new standards. In New York City, the number of students scoring proficient in English fell to 42% this year from 69% in 2009. In math, 54% of city children scored proficient this year, down from 82%. The huge drops across the state raised questions about how much of the academic gains touted in the past several years were an illusion. As Neal McCluskey revealed (and Greg highlighted), Checker made an excellent case against national standards… in 1997. The Weekly Standard has now allowed non-subscribers to link to the piece, so everyone can read it for him or herself. Many of Checker’s arguments against national standards and assessments back in 1997 are remarkably similar to those of current critics. If Education Secretary Arne Duncan has his way, kids would be spending a lot more time at school — and a three-month summer would be a thing of the past. Duncan joked with attendees at a luncheon at the National Press Club Tuesday in Washington that he would like schools to stay open 13 months out of the year. Then he told the audience of over 100 that he seriously supports longer school hours. He continued by explaining that the American school calendar is antiquated and must be modified so that American students can compete at the highest levels internationally. Publisher Pearson is hoping to profit from the government’s ‘free schools’ initiative, sparking a fresh debate about the privatisation of education. Chief executive Marjorie Scardino, 63, revealed the group’s continuing push into the education market as she dropped a strong hint that she was preparing a successor to replace her. One of the longest-serving bosses at a FTSE 100 company, Scardino said that while she still enjoyed her role at Pearson, there were ‘multiple candidates’ for her job. Finance director Rona Fairhead and FT chief executive John Ridding are seen as the leading internal candidates. A few weeks ago I was asked to a friend’s son’s christening. “We haven’t found God, just a really good church school” she scrawled across the bottom of the invitation. In days gone by I might have huffed and puffed about the hypocrisy of it all. But now I’m a parent myself and school admission is hovering on the horizon. We share the dilemma faced by thousands of families across London. Our home is just about equidistant between a fairly average Church of England school and a local primary that has been in special measures for the past two years. The idealist in me says stand by your principles — I believe in community and the impact supportive parents can have on a school. The parent in me says: do whatever is best for your child’s education. But the choice, such as it is, also makes me cross. Why are so many inner London schools still so poor that parents feel they have to lie about religion, compromise their principles, or even — and most can’t afford this option — move house to secure a half-decent place? We’re not even on to secondary yet. Education Secretary Michael Gove claims he gets it. His academies bill — passed in the Commons last night– allows schools to opt out of local authority control and be directly funded by government. They will have greater freedom over the curriculum and teachers’ pay and access to extra funds currently administered by councils. The nation’s education czar joined a growing chorus of public officials who believe residents should decide whether Detroit Public Schools is placed under the mayor’s control. For that to happen, however, the City Council has to place the question on the November ballot. The council will weigh the matter during its meeting today. On the eve of the meeting, and a week after Gov. Jennifer Granholm supported such a move, U.S. Education Secretary Arne Duncan said he also favored the ballot initiative, said a spokesman. As the new city school board president, Freda Williams is the keel on a boat that is suddenly in new water. The $90 million grant from the Bill & Melinda Gates Foundation and $68.5 million in federal Race to the Top stimulus funds have focused national attention on Memphis schools. At the same time, the school district awaits a state Supreme Court ruling on city funding of schools, and may face a possible referendum on who will pay for schools. If the funding issue goes to the voters this fall, expect a campaign for funding led by the school board, Williams said. Budget/Financing, Community Partners, Events, School Climate, What Can I Do? Before you read any further, please view our video message to you by clicking here (or cutting and pasting this into your web browser: http://www.youtube.com/watch?v=vFpEFFWljR4). Also, join the Urban League of Greater Madison on Facebook, show your support, and stay up-to-date on our activities by clicking here. Our Community Engagement Initiative is well underway! We began training volunteers and canvassing the Burr Oaks and Bram’s Addition Neighborhoods last week. We will soon visit the Capital View and Leopold Neighborhoods, and then make our way to the Village of Shorewood, Glenn Oaks, and Hill Farms Neighborhoods. We are continuing to recruit volunteers and organizational partners to get out on the streets with us and talk with residents and business owners about their vision for the future of our city and region. If you want to know what the community thinks first hand and want to develop connections with members of our extended family of 500,000+ who reside in greater Madison, come join us. Our next Community Outreach training will be held Tuesday, August 3, 2010 from 5:30pm – 7:00pm at our new Urban League Center for Economic Development and Workforce Training headquarters located at 2222 South Park Street, Madison, 53713. Participation in a training session is required in order to participate in our campaign, so if at all possible, please plan on joining us for this session. If you can’t make it, there will be additional sessions held in the future. We will conclude our campaign on October 15, 2010, and soon thereafter will share the outcomes of our 3-month community engagement effort with all organizations and individuals who get involved. Please contact Andrew Schilcher at aschilcher@ulgm.org or (608) 729-1225. We’re already learning a lot about the dynamics and make-up of our neighborhoods that can only be learned by putting boots on the ground! In August 2010, the CEOs of the Boys & Girls Club and YMCA of Dane County will join me on a community walk with Madison Mayor Dave Cieslewicz through South Madison to talk with residents and business owners, and discuss community development needs and interests. We will also host a public hearing on the City Budget at the Urban League and a seminar for individuals interested in serving on City of Madison Commissions and Boards. We are particularly interested in increasing diversity on these Boards and Commissions and look forward to working with County leaders to accomplish the same. All events listed below are located at our Urban League headquarters in Madison at 2222 South Park Street, 53713 in our first floor Evjue Conference Room. To RSVP for either of the activities below, please contact Ms. Isheena Murphy at imurphy@ulgm.org or 608-729-1200. We are working with the Dane County leadership to provide similar forums as well. Last night, we completed the first of two Leadership Summits with young professionals ages 25 – 45 that we are hosting aboard the Betty Lou Cruises on Madison’s local treasurer, Lake Monona. What a great group of professionals we had join us – 32 leaders who are making a positive difference in our community and who have committed themselves to do more to establish greater Madison as the BEST place to live in the Midwest for EVERYONE. We would like to give special thanks to our Corporate Sponsor for tonight’s Cruise, Edgewood College. We also want to thank Wisconsin State Senator Lena Taylor for giving an inspiring and motivational talk, and for challenging us to get more deeply involved with local and state affairs. We sincerely thank everyone who participated and look forward to our 2nd cruise next week, August 3rd! Stay tuned for information regarding our plans for a 46 and older “Mentors and Coaches” event, which we are planning for early 2011. Book Description: The Midwest has always been the heart of America – both its economic bellwether and the repository of its national identity. Now, in a new, globalized age, the Midwest faces dire challenges to its economic vitality, having suffered greatly before and as a result of the recent market collapse. In Caught in the Middle, veteran journalist Richard C. Longworth explores how globalization has battered the region and how some communities are confronting new realities. From vanished manufacturing jobs to the biofuels revolution, and from the school districts struggling with new immigrants to the Iowa meatpacking town that can’t survive without them, Longworth surveys what’s right and wrong in the heartland, and offers a tough prescription for survival. Economists have generally thought that the answer was not much. Great teachers and early childhood programs can have a big short-term effect. But the impact tends to fade. By junior high and high school, children who had excellent early schooling do little better on tests than similar children who did not — which raises the demoralizing question of how much of a difference schools and teachers can make. Hey Madison parents, teachers and students, get ready for some changes. I wrote about a letter sent to teachers several weeks ago, but snags in transporation had the plan still tentative until today. Now it’s official: A plan for teacher collaboration at the Madison middle and high school levels beginning this fall will alter daily and weekly schedules for all eleven local middle schools and four high schools. The most immediate change will be early release most Wednesdays for both high school and middle school students; middle school classes (except at Wright Middle School) will end on Wednesdays at 1:37 p.m. School will end at Wright at 2:15 p.m.
Economists have generally thought that the answer was not much. Great teachers and early childhood programs can have a big short-term effect. But the impact tends to fade. When Mr. Chetty and his colleagues took another look at the students in adulthood, they discovered that the legacy of kindergarten had re-emerged. Wisconsin lost its bid for $250 million in federal education reform grant money Tuesday, as 18 other states and Washington, D.C., were named finalists in the second round of the Race to the Top competition. U.S. Education Secretary Arne Duncan announced the finalists for $3.4 billion in funding during a speech to the National Press Club in Washington, D.C.
Those finalists were Arizona, California, Colorado, Florida, Georgia, Hawaii, Illinois, Kentucky, Louisiana, Maryland, Massachusetts, New Jersey, New York, North Carolina, Ohio, Pennsylvania, Rhode Island, South Carolina and Washington, D.C. This was Wisconsin’s final chance to win a piece of the $4.35 billion education reform competition, unless a proposed third round of $1.35 billion in 2011 is approved. Gov. Jim Doyle criticized the federal government’s system for reviewing state applications, while several outside groups criticized Wisconsin for passing weak reform efforts or failing to show it could dramatically change the course of the troubled Milwaukee Public Schools. “With the blind judging system used by the federal government, it’s hard to know how the applications were scored, but it’s pretty clear that the quality of a state’s education system was not taken into account,” Doyle said in a statement. “The states in the upper Midwest – Wisconsin, Minnesota, Iowa and Michigan – are nationally recognized as having the best education systems in the country, and not a single one was a finalist in either round for Race to the Top funding,” he said. Education Secretary Arne Duncan was being too modest when he said in a speech Tuesday at the National Press Club that the Obama administration is playing a “modest role” in sparking a “quiet” revolution in education. There is nothing modest about the administration’s role in driving reform, and there is nothing “quiet” about the change process, not in Washington or in state legislatures that rushed to change laws for a chance to win federal dollars. The administration is Bigfoot, driving change with billions of dollars in the Race to the Top competition. In fact, Race to the Top, which started with $4.35 billion, is doling out the largest pot of discretionary federal education money ever. How’s that for modest? Duncan announced the finalists for Round 2 — 18 states and the District of Columbia — each of which will send teams to Washinton, D.C., in August to explain why they deserve to be on top. As the fifth anniversary of Hurricane Katrina approaches, the superintendent brought in to revive New Orleans’ troubled public schools is bidding farewell after turning many of the schools into charters. Before his departure, Paul Vallas speaks with John Merrow about where things stand with the city’s school reform efforts. JOHN MERROW: For Paul Vallas, the veteran superintendent Louisiana hired in 2007 to do the job, the pressure was on. PAUL VALLAS, superintendent, Recovery School District of Louisiana: We need to move now. We need to start building buildings now. We need to modernize those classrooms now. JOHN MERROW: Almost from the time he arrived in New Orleans, Paul Vallas began making promises, talking publicly about all the big changes he intended to make in the schools. Well, it’s been three years. Time for Paul Vallas’ report card. PAUL PASTOREK, Louisiana State Superintendent of Education: I give Paul very high marks. JOHN MERROW: State Superintendent Paul Pastorek hired Paul Vallas. PAUL PASTOREK: If you would tell people five years ago what is happening today, no one would have believed it was possible. Do the languages we speak shape the way we think? Do they merely express thoughts, or do the structures in languages (without our knowledge or consent) shape the very thoughts we wish to express? Take “Humpty Dumpty sat on a…” Even this snippet of a nursery rhyme reveals how much languages can differ from one another. In English, we have to mark the verb for tense; in this case, we say “sat” rather than “sit.” In Indonesian you need not (in fact, you can’t) change the verb to mark tense. In Russian, you would have to mark tense and also gender, changing the verb if Mrs. Dumpty did the sitting. You would also have to decide if the sitting event was completed or not. If our ovoid hero sat on the wall for the entire time he was meant to, it would be a different form of the verb than if, say, he had a great fall. In Turkish, you would have to include in the verb how you acquired this information. For example, if you saw the chubby fellow on the wall with your own eyes, you’d use one form of the verb, but if you had simply read or heard about it, you’d use a different form. Donald Trump is not the only one who knows how to get attention with the words, “You’re fired.” Michelle Rhee, chancellor for the District of Columbia schools, has just done a pretty nifty job of it herself. On Friday, Ms. Rhee fired 241 teachers–roughly 6% of the total–mostly for scoring too low on a teacher evaluation that measures their performance against student achievement. Another 737 teachers and other school-based staff were put on notice that they had been rated “minimally effective.” Unless these people improve, they too face the boot. The mass dismissals follow a landmark agreement Ms. Rhee negotiated with the Washington Teachers Union (WTU) at the end of June. The quid pro quo was this: Good teachers would get more money (including a 21.6% pay increase through 2012 and opportunities for merit pay). In exchange, bad teachers could be shown the door. Starting this September, middle and high school students in Mount Olive won’t be getting D’s anymore — because the board has dropped that letter from its grade system. Now, any score below 70 percent is an F.
The move passed the the Mount Olive School board in an 8-1 vote Monday. Superintendent Larrie Reynolds, who proposed the new policy last month, says it will raise the bar for Mount Olive students. The group today reported that pre-tax profits were £94m in the first half compared with a loss of £7m in the same period in 2009. Sales at the group climbed to £2.34bn from £2.14bn. Kwabena: What does LBS look at when it comes to selecting candidates for its programs? OliverAshbyLBS: This is a very good question. At London Business School we take a holistic view when assessing applications. All our programs require a GMAT score, references, and some form of essay. We also believe that cultural fit is hugely important. Children who take part in musical training have an advantage in learning that spills over to skills that include language, speech, memory, attention, and even vocal emotion. Research on the effects of music training on the nervous system has strong implications for education, says Nina Kraus, the Hugh Knowles Professor of Communication Sciences and Neurobiology at Northwestern University and director of the Auditory Neuroscience Laboratory. My clients never fail to amuse. “Can I have a military discount?” one asked. “Do you give student discounts?” asked another. No and no, I thought, hitting Delete on those e-mails. In the business of doing other people’s homework, there are no discounts of any kind. (Who needs my services besides students, anyway?) All sales are final, and all payment is upfront. No one gets free credit — well, they get credit from their instructors, plus high grades and lots of compliments. I entered this business purely by accident. A victim of the craptastic economy, I’ve done all sorts of things for money. I’ve cleaned maggots out of other people’s kitchens. I’ve scraped cat poop off carpets. I’ve watched small screaming children for hours at a time. But doing college homework for cash? That one took me by surprise. It began innocently. Having tutored writing at a small private school, I decided to offer my services to the larger market via Craigslist. Soon, a prospect contacted me. Does Milwaukee need another art school? 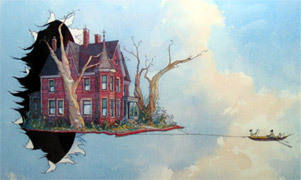 There are numerous schools in Milwaukee where you can receive an art-centric education. Milwaukee Institute of Art and Design, Marquette University, UWM, Mt. Mary College, and Milwaukee Area Technical College are some schools that offer creative degrees in the area. So do we need another school offering degrees in fields like Advertising, Film making, Graphic Design, Culinary Arts, Fashion Marketing, Interior Design, Media Arts and Animation and Interactive Media? AI-Milwaukee (one of 48 Art Institutes across the nation) will enroll its first students in October at a 35,000 sq. ft. campus on Buffalo Street in the Third Ward. It will offer baccalaureate degrees in the aforementioned disciplines, along with an associate degree in Graphic Design. Johnson said degrees are designed to attract students with an “art bent” and prepare them for entry-level jobs in their selected fields. It was a course for the true economic elite. Hundreds of children from the mainland’s wealthiest families gathered to hear words of wisdom from the people who advise the country’s top leaders. The topics ranged from ancient emperors’ secrets about managing the succession of power to the strategies used by the People’s Liberation Army to keep its soldiers loyal. The course, sponsored by the All-China Federation of Industry and Commerce in Beijing, caught the nation’s attention and quickly turned into a hot internet discussion topic because it was tailored for what Xinhuanet called “the second generation of the rich”, whose family companies have blossomed since the nation embraced capitalism in 1979.
mention on what was going on in the contract talks between SPS and SEA. I received this e-mail from the SEA. I post without comment. • use of evaluations as the lead factor in reduction in force, as opposed to strict seniority. A tussle over the Jersey City schools superintendent’s $280,000-a-year contract is headed for a showdown involving New Jersey’s education commissioner, putting a spotlight on one of the state’s most troubled school districts. Charles Epps has been superintendent for the past 10 years. Twenty-six of his 37 schools failed last year to make “adequate yearly progress,” according to federal standards, and one middle school—where only 32% of children are proficient in English and 25% proficient in math–has fallen short of the federal goal nine years straight. Late last month, the local school board voted to forgo an outside search for a new superintendent and to begin negotiating a new three-year contract with Mr. Epps. That enraged some local activists, who have filed a petition with the state to overturn the board’s vote. “There’s a window of opportunity to stop rewarding failure,” said Steven Fulop, a Jersey City council member who is helping to spearhead the opposition. “Nobody in their right mind would rehire someone who has failing performance without even a cursory look at who else is out there.” The petition accuses the school board of failing to give 30 days’ notice and opportunity for the public to voice their opinions before the vote. New Jersey’s largest school district will create a special enterprise zone for education in September, bringing together seven low-performing schools for an ambitious program of education and social services provided through a coalition of colleges and community groups led by New York University. The Newark schools — Central High School and six elementary and middle schools — will be part of a Global Village School Zone stretching across a poor, crime-ridden swath of the city known as the Central Ward. The zone is modeled after the Harlem Children’s Zone, a successful network of charter schools and social service programs, and represents the latest in a growing number of partnerships between urban school districts and colleges. While the Newark zone will remain part of the city’s long-troubled school system, which has been under state control since 1995, its schools will be largely freed from district regulations and will be allowed to operate like independent charter schools. Decisions about daily operations and policies will be turned over to committees of principals, teachers, parents, college educators and community leaders, and the schools will be allowed to modify their curriculum to address the needs of students. Online grading platform LearnBoost has raised $975,000 in seed funding from an impressive roster of venture capital firms and angel investors including Bessemer Venture Partners,Charles River Ventures, RRE Ventures, Atlas Ventures,Othman Laraki, Bill Lee, James Hong, Naval Ravikantand Karl Jacob. LearnBoost offers teachers an easy-to-use, web-based gradebook. The startup’s software allows for real time collaboration around grades between teachers and parents. But LearnBoost is also trying to create a realtime CRM-type of application for teachers. A LearnBoost gradebook account allows teachers to essentially manage their classroom in one place by keeping track of student grades, tracking attendance, maintaining schedules, importing Google calendars, creating and managing lesson plans and curriculum, tagging standards to assignments and lesson plans, and more. The app is still in private beta and will be released to the public in August. The recent layoff of 80 police officers in Oakland could be the harbinger of things to come as government officials find that public employee pension deals made when the stock market was booming are helping bust their budgets today. “It’s regrettable, but we had no choice,” said City Council President Jane Brunner of the layoffs that were Oakland’s response to a growing public pension crisis. Forced to make a $30.5 million budget cut – Brunner said that’s more than the city’s discretionary spending – Oakland had asked police officers to pay 9 percent of their salaries toward their pensions and accept a later retirement age for new hires. California’s public school system has finally found itself at the top of a list. According to a new report, its academic standards are the highest in the country. But in less than two weeks, California’s State Board of Education will vote on whether or not to swap them out for new national standards-and there may be good reason to do so. California’s academic rigor may be high, but its student proficiency rates still trail behind many states with less stringent standards. Consider the state of Maryland. According to a study released by the Thomas B. Fordham Institute, an education think tank, Maryland’s standards are less rigorous than California’s. But a separate report by Education Week ranked Maryland first in the country for overall quality, with high marks for the indicators that measure academic achievement and a student’s success from school to the workforce. Supporters of the switch to the Obama administration’s so-called “Common Core Standards,” including Governor Arnold Schwarzenegger and State Superintendent of Public Instruction Jack O’Connell, say that the new framework makes more sense because it focuses on building critical grade skills and abilities rather than touching on a long list of academic materials. Centenary College is closing its satellite business schools in China and Taiwan after discovering rampant cheating among local students, campus officials said. The cheating was so extensive that the Hackettstown college is withholding degrees from all 400 Chinese-speaking students in its master’s of business administration programs in Beijing, Shanghai and Taiwan, said Debra Albanese, Centenary’s vice president for strategic advancement. The students were told they have until the end of the month to decide whether to take a comprehensive exam to earn their degree or accept a full tuition refund So far, school officials said, most students have opted for the refund of their $1,200-to-$1,400 tuition. A more rigorous high school curriculum is paying off in better college entrance scores for state students. Michigan’s tough, new high school curriculum is passing the test. Scores for state high school students on the Michigan Merit Examination, which includes the ACT, climbed by half a percentage point, meaning students will enter college better prepared. The results, released Thursday by the Michigan Department of Education, show high school students have improved their ACT scores for the third year in a row. 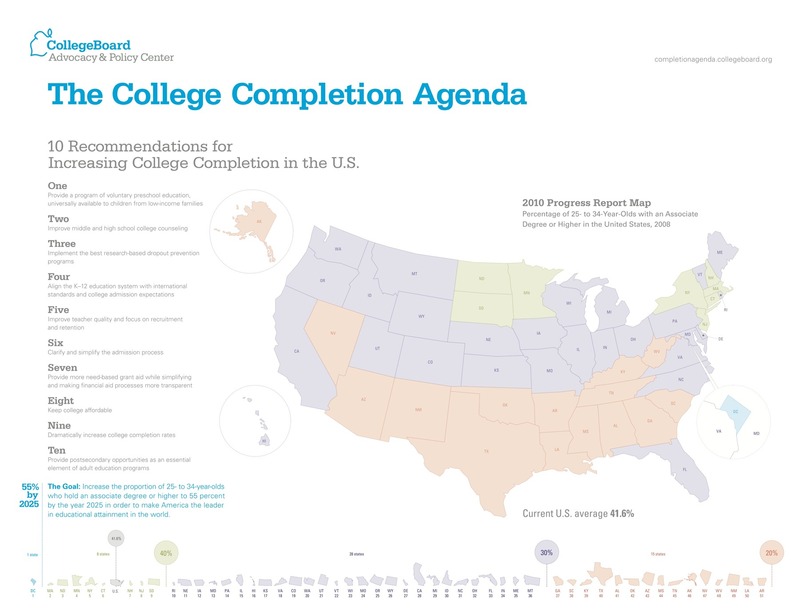 The steady improvement, from an average score of 18.8 in 2008 to 19.3 this year, demonstrates the rigorous high school graduation requirements adopted in 2006 are gradually paying off. Four prominent Pennsylvania Republicans are earning more than a combined $1 million a year as directors on three boards connected with the Milton Hershey School, one of the state’s wealthiest charities and the nation’s largest residential school for disadvantaged children. LeRoy Zimmerman, a former two-term attorney general who has headed the charity since 2006, earned the most, $499,996, according to the group’s latest tax filing with the Internal Revenue Service. James Nevels, a Philadelphia investment manager, who was compensated $325,359 on two Hershey-related boards. Former Gov. Tom Ridge, who is earning $200,000 a year on the Hershey Co. board. Lynn Swann, former gubernatorial candidate and Pittsburgh Steeler star, who is making $100,000 a year on the board of the company that operates Hersheypark. The Madison School District will ask for proof of age when registering students who live with people other than their parents or guardians or those who are 18 years or older and are enrolling themselves for school. The district disclosed the new procedure — which goes into effect next month for the 2010-11 school year — in a statement to the State Journal dated July 23 and received Monday. The announcement comes three months after the revelation that a 21-year-old gang member charged in a fatal April shooting had enrolled in Madison’s West High School and later transferred to Middleton High School under a fake name and age. Ivan Mateo-Lozenzo, 21, was enrolled at Middleton High School as 18-year-old junior Arain Gutierrez at the time of the shooting. Middleton officials have said Mateo-Lozenzo, who police have identified as an illegal immigrant from Veracruz, Mexico, had transferred from Madison’s West High School. How will Portland schools fare when gifted education funding is cut? Few U.S. citizens would agree to cutting special education funds. After all, students with an Individualized Education Plan (IEP) obviously learn differently and need increased time and attention from educators in order to ensure they are attending to and learning the academic standards. However, another group of students who learn differently and need time and attention to guide their learning of the academic standards are being denied this year. These are the gifted students. Portland schools may not feel an immediate impact from the loss of the Javits Program. However, this program provides scholarships to the disadvantaged gifted student and research support in the area of effective instructional practices for these students who learn differently than their peers. People in other big-city school districts around the country have a hard time thinking of Portland Public Schools as a truly urban district. Not only is Portland tiny (47,000 students, compared with 700,000 in Los Angeles), but only 43 percent of its students are poor (in Chicago, 85 percent are). A majority are white (in Philadelphia, 13 percent are). What’s more, middle- and upper-income professionals in Portland do something their counterparts in Detroit, L.A. or Washington, D.C., rarely consider: They send their children to central-city public schools. But there is one way in which our small, mostly white, heavily middle-class school system is statistically right in line with some of the grittiest urban districts in the nation: A shockingly low share of Portland’s high school students earn diplomas. As The Oregonian reported on the front page recently, just 53 percent of Portland’s high school students graduate in four years. Portland’s 2010-2011 budget is $653,796,298 = $13,910.55 per student. Madison spent $15,241 per student during the 2009/2010 budget. In his much-discussed recent Wall Street Journal op ed, Virginia Senator James Webb makes some good points about affirmative action and race, but also some key mistakes and omissions. On the plus side, Webb’s article highlights the contradictions between the “diversity” and compensatory justice rationales for affirmative action. He also correctly suggests that slavery and segregation inflicted considerable harm on southern whites as well as blacks; it is therefore a mistake to view these injustices as primarily a transfer of ill-gotten wealth from one race to another. On the negative side, Webb is very unclear as to his own position on affirmative action. He also seems to blame racism and the historic economic backwardness of the South on the machinations of a small elite. The reality was more complicated. Low-income southern whites were often much more supportive of racism and segregation than economic elites were, and Jim Crow might have been less virulent without their support. I. Competing Rationales for Affirmative Action. Clusty Search: James Webb, Ilya Somin. Over the last several months I have been in many meetings with HR and L&D professionals talking about the enormous power of formalized informal learning. As we walk through out enterprise learning framework and talk with people about the need to expand their concept of training, I am reminded of the work we did back in 2003 and 2004 when I wrote The Blended Learning Book® (which is just as important to understand today as ever before). Here are a few of the jewels I want to remind everyone to consider. Budget/Financing, Community Partners, Elections, Governance/Board Decision Making, What Can I Do? Ten candidates filed this month to run for five open at-large seats on the Rockingham County Board of Education. Voters will chose among them during the November general election to address Rockingham County Schools’ biggest issues and opportunities. These include an expected tough budget in 2011-12, academic performance and technology in schools. Corey Brannock, 32, of Eden, works as a wastewater treatment plant operator in Mayodan. He has never run for elected office but decided to after volunteering at Central Elementary and witnessing crowded classrooms and stressed teachers. Thanks to a dual credit program at her high school, Casey Hahney, of Hammond, was able to transfer her credits and enroll at Ivy Tech Community College Northwest. Dual credit is designed for high school juniors and seniors, enabling them to earn college credits while fulfilling high school requirements. Educators say dual credit may not mean that students will finish college in less than four years but it may reduce the number of students finishing in six years. Local colleges and universities recently reported six-year graduation rates in 2008 well below 50 percent, also less than the national average of 55.9 percent. Not every high school graduate will go on to college. But for those who do, a basic high school diploma may not give them the preparation they need. Dual credit classes range from English to anatomy or engineering. It saves times and money, and gives students a leg up, helping to prepare them for a successful college career. Related: Janet Mertz’s tireless effort: Credit for non-MMSD courses. New evidence that the minimum wage has hurt teenage workers. Today marks the first anniversary of Congress’s decision to raise the federal minimum wage by 41% to $7.25 an hour. But hold the confetti. According to a new study, more than 100,000 fewer teens are employed today due to the wage hikes. Economic slowdowns are tough on many job-seekers, but they’re especially hard on the young and inexperienced, whose job prospects have suffered tremendously from Washington’s ill-advised attempts to put a floor under wages. In a new paper published by the Employment Policies Institute, labor economists William Even of Miami University in Ohio and David Macpherson of Trinity University in Texas find a significant drop in teen employment as a direct result of the minimum wage hikes. While some kids played baseball this summer, some put on a musical based on the history of the sport. In fact, participation in the Village of DeForest Parks and Recreation Department Musical Theater doubled this summer when 25 children ages 7 to 11 signed up. Normally, the program draws about a dozen participants. Pam Smith, who teaches music at Yahara and Morrisonville elementary schools, proposed the idea to the parks and recreation department more than five years ago. Each year she has participants put on a musical with a different theme. “The Inside Pitch,” a musical composed by Michael and Jill Gallina, was performed this year. Pearson, which also owns Penguin Books, has agreed to buy the “learning systems” division of Sistema Educational Brasilerio (SEB), as part of the FTSE 100 company’s plan to expand its presence in south America. The deal will more than double the size of Pearson’s education business in Brazil and includes an agreement that will ensure that SEB’s remaining schools and higher education institutions remain “major customers” of Pearson. The acquisition comes after Dame Marjorie Scardino, Pearson’s chief executive, pledged to reinvest the company’s £900m windfall from the sale of its majority-stake in market data provider IDC into expanding its education business in fast-growing economies. Pearson said Brazil is one of the world’s largest education markets with 56m students and an educational materials market valued at about $2bn. Pearson said it expects the new division to generate sales of about 160m reais this year. Board Meeting Archives, Budget/Financing, Community Partners, Elections, Events, Governance/Board Decision Making, Legal Rights, School Climate, What Can I Do? The first finding of the Audit Report is “The Seattle School District did not comply with state law on recording meeting minutes and making them available to the public”. Id., p. 6. The auditor found: “We determined the Board did not record minutes at retreats and workshops in the 2008 – 2009 school year. Id. These retreats and workshops were held to discuss the budget, student assignment boundaries, school closures and strategic planning”. [Emphasis Supplied] Id., p. 6. The school board’s decisions regarding student assignment boundaries and school closures are the subject of the Commissioner’s ruling denying review in the Briggs and Ovalles discretionary review proceedings and in this original action. The Auditor described the effect of these violations to be: “When minutes of special meetings are not promptly recorded, information on Board discussions is not made available to the public”. Id., p. 6. The Auditor recommended “the District establish procedures to ensure that meeting minutes are promptly recorded and made available to the public.” Id., p. 6. The District’s response was: “The District concurs with the finding and the requirement under OPMA that any meeting of the quorum of the board members to discuss district business is to be treated as a special or regular meeting of the OPMA.” Id. p. 6. Thus, the school board admits the Transcripts of Evidence in the Ovalles and Briggs appeals contains no minutes of the discussions relating to student assignments and school closures, even though the law required otherwise. Additionally, there is no indication of what evidence the school board actually considered with regard to the school closures and the new student assignment plan at retreats and workshops devoted to these specific decisions. areas we examined we found lax or non-existent controls in District operations. …” Id., p. 25. With regard to the Open Meetings Act the Auditor noted continuing violations of state law and that “the District did not develop policies and procedures to adequately address prior audit recommendations.” Id, at p. 27. Related: Recall drive for 5 of 7 Seattle School Board members. Time is on my side, the Rolling Stones sang in the 1960s. Seems like it was. They’re still rich and famous four decades later. But what about millions of school kids, especially those on the short end of educational good fortune? What if time – namely, too little of it in constructive educational situations – is working against them? The way time is and is not used to give kids valuable educational experience is a good subject here at the height of the summer, when a large number of kids, especially those with the biggest challenges in school, are likely going backward educationally. “Summer learning loss” is the term for the well-documented problem of kids coming back to school around Labor Day with erosion in their skills. Should something be done about the classic school schedule – 180 days a year, usually not more than seven hours from the time a student walks in the door until dismissal, with 10 weeks or more off in the summer? The current calendar became the norm more than a century ago, and many trace its origins to an economy that leaned heavily toward agriculture. Kids were needed to help out during the growing season. Since the start of American public schools, both well-meaning and not so well-meaning people have tried to reform them. Movements have ranged from the introduction of “teaching machines” to the current political cry for increased testing, market-model accountability and school choice. Until recently, most reform efforts have been relatively benign, with no serious threat to the concept of public education. That was changed during the George W. Bush administration and it continues under President Obama. His plans are punitive, counter-productive to real reform and insidious in intent. They do pose serious threats to the very existence of the American public school system. Fresh from his hard-earned, well-deserved victories in health-care reform and financial regulation, Obama is now redirecting his energy toward education reform. This time, though, he is acting on bad advice, misinformation about education and denial of valid research that rebuts the plan he supports. Race to the Top (RTTT) is the name of President Obama’s plan, spearheaded by U.S. Secretary of Education Arne Duncan. Under it, states submit an application to the federal government with their “best blueprint” for reform. Duncan has devised a model for the states to follow that’s composed of several elements, each given a point value. The total number of points possible, if all criteria are met, is 500. The model includes provisions for taking over “failing schools” and encouraging the establishment of charter schools, many of which are funded by such organizations as the self-serving Gates Foundation. Recent national studies have found no significant difference between the education students receive in charter schools and public schools — but the studies are ignored. Let’s get one thing straight, right from the start: We love $100,000 teachers. We wish Illinois had more of them. You wouldn’t know it to listen to Ken Swanson, president of the Illinois Education Association, who didn’t like Tribune reporter Diane Rado’s story about the concentration of teachers earning $100,000 a year in some suburban school districts. Swanson is urging teachers to write letters to the editor or cancel the paper because he believes the news story was driven by the editorial board. “From the first sentence of the article, it was apparent that this was another education-bashing Tribune editorial, thinly disguised as a news story,” Swanson wrote in a letter to members. Attending school in California and becoming an engineering major can really pay off for college graduates — by thousands of dollars a year. According to a report released Thursday from salary-tracker PayScale.com, petroleum engineering majors and graduates of Harvey Mudd College are taking home the biggest paychecks. While mid-career salaries fell 1.5% overall between 2009 and 2010, engineers, scientists and mathematicians continued to rake in the big bucks, as well as students who graduated from Ivy League schools. The state’s public worker unions are at war with Gov. Chris Christie, but they have not ramped up their political spending. The New Jersey Education Association’s political action committee spent $234,788 in the first half of this year, according to reports released today by the state Election Law Enforcement Commission. At this point last year, when there were far more state-level political races, the union had spent $426,200. This year, the NJEA has raised $797,841 and has $1.2 million on hand. The PAC for New Jersey’s largest state workers union, the Communications Workers of America, has taken in $77,000 so far this year and has spent $78,169, the reports show. The Wisconsin Education Association Council is the top lobbying organization in the state, outspending #2 by more than two to one. An infant’s intelligence is shaped more by family environment than by the amount of omega 3 fatty acid from breast milk or fortified formula, new research shows. Scientists followed 241 children from birth until they reached four years of age to investigate the relationship between breastfeeding and the use of DHA-fortified formula in infancy and performance in tests of intelligence and other aspects of brain function. Details appear in the Archives of Disease in Childhood. After taking into account the influence of mothers’ intelligence and level of education, researchers found no relationship between the estimated total intake of DHA in infancy and a child’s IQ. Babcock, an economist at the University of California, Santa Barbara, reviewed two sets of research literature that document crisscrossing trends. Nia Lozano, a middle school parent, tells us about a new group that’s building support for Oakland High School. An interesting new group has formed in the Crocker and Glenview neighborhoods of Oakland. It was formed by some parents from Edna Brewer who would like other neighborhood parents to consider Oakland High. What I gather is that the new principal is well regarded and that may have sparked the interest, besides the fact that if parents could raise the community profile of Edna Brewer, they should be able to do the same with O High. When David Brewer III was on the outs – but had not yet been ousted – as superintendent of the Los Angeles Unified School District, he appointed Ramon Cortines as senior deputy superintendent. It was a bogus title, and everyone knew it. Cortines had decades more experience than Brewer, a former Navy admiral who had never worked in a school district before. Cortines had been Mayor Antonio Villaraigosa’s deputy mayor of education and head of the Partnership for Los Angeles Schools. Before that he had run some of the nation’s largest districts, including New York and L.A. Unified. So, who was whose deputy? The arrangement was a way for the district to have a competent leader while the Board of Education figured out a graceful exit for Brewer. Eight months later, in January 2009, the transition was formalized. Wisconsin’s approach to funding schools relies on a confusing and frequently misunderstood formula under which the state picks up the bulk of costs while capping how much districts can collect in state aid and local property taxes combined. Districts have complained the caps, which are based largely on the number of students a district has, have not kept pace with expenses. In recent years, the state has reduced its share of aid to schools from two-thirds of total costs to slightly less than that, forcing districts to choose between two unpopular options: Cutting programs and services or raising property taxes. MMSD is one of the most expensive public school districts in the state (per pupil spending is highest among the largest school districts). It has been for decades. 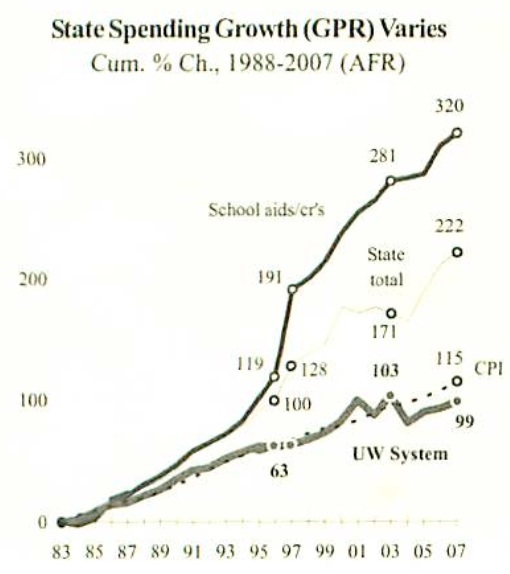 However, the annual rate of increase in per pupil spending has been very close to the Wisconsin average. While per pupil spending for the average Wisconsin public school district has increased at an annual rate of 5.10%, it has increased by an annual rate of 5.25% in MMSD (see table below). That MMSD costs have risen more should be no surprise, because of cost of living, the loss of students to the growing suburbs (subsidized by state taxes), and the relative portion of special education needs and classroom support needs have risen significantly. The “great recession” has certainly affected many organizations, including public school districts via slower tax collection growth and flat or reduced property values (which further increases taxes, such as the 2010-2011 Madison School District budget, which will raise them by about 10%). Board Meeting Archives, Budget/Financing, Community Partners, Curriculum, Elections, Events, Governance/Board Decision Making, School Climate, Staff Support, Student Support, Teacher Support, What Can I Do? On Thursday at 10:30 AM an appeal of the Superintendent’s one-year contract extension to June 30, 2013 will be filed at the King County Courthouse. At 1:30 PM filings initiating the recall and discharge of each of five Seattle School Directors will be filed at the King County Elections Office. Directors Sundquist, Maier, Martin-Morris, Carr, and DeBell are the subjects of these five recalls. Directors Smith-Blum and Patu are not subjects of recall. Each of these filings rely heavily on the Washington State Auditor’s Audit issued on July 6, 2010 for evidence. See Seattle Weekly’s coverage of the audit here. using the subject line “RECALL”. We expect to receive authorization to begin collecting signatures within 30 days of initial filing. Signatures will be gathered from voters registered in the City of Seattle. We hope that most voters will choose to sign all 5 petitions. Approximately 32,000 valid signatures will be needed for each director to bring about a recall election. A 180 day maximum for signature gathering is allowed and the election is scheduled 45 to 60 days after the required number of signatures has been submitted and verified. Related: Governance, or Potted Plant? Seattle School Board To Become More Involved In District Operations and a view from Madison. Researchers Kyla Wahlstrom and Karen Seashore Louis from the University of Minnesota College of Education and Human Development and Kenneth Leithwood and Stephen Anderson from the University of Toronto, have broad implications for the understanding of how leadership affects learning across the United States. “Leadership is important because it sets the conditions and the expectations in the school that there will be excellent instruction and there will be a culture of ongoing learning for the educators and for the students in the school,” said Wahlstrom. The report Learning from Leadership: Investigating the Links to Improved Student Learning, found that student achievement is higher in schools where principals share leadership with teachers and the community. A proposal from Gov. Chris Christie to overhaul teacher contract negotiations has gained support from management while further angering the state teachers union. As part of his proposed toolkit to reduce property taxes statewide, Christie is calling for the move back to allowing “last offer/best offer” in negotiations. The system would allow Boards of Education to unilaterally impose a contract on a local union in the event negotiations broke down. The system was allowed in New Jersey until banned by law in 2003. Frank Belluscio, a spokesman for the New Jersey School Boards Association, said the proposal would provide assistance to school boards by allowing them to impose final offers when negotiations drag on. Current policy allows boards and teachers unions to go to a binding arbitration, which Christie and municipal leaders have said resulted in larger compensation awards to unions. Associations representing state teachers and school boards have expressed opposition to a proposal in Gov. Chris Christie’s property tax toolkit to increase state oversight to contracts negotiated between school districts and local unions. The proposal would set a four point criteria for county executive superintendents of schools to review local contracts, with the governor’s goal to keep property taxes below the two percent cap Christie signed into law earlier this month. The criteria, as outlined in a preliminary proposal to the New Jersey School Boards Association from the governor’s office earlier this month, would include county executive superintendents reviewing all contracts that have the total compensation and benefits exceeding the cap, did not allow subcontracting of such services as food and maintenance, did not allow employee contributions to health benefits and did not set a minimum number of instructional hours and days. The proposal was drafted when the cap was the two and a half percent constitutional amendment and not the two percent statutory cap, Christie negotiated with the legislature. “SCHOOL reform chaos?” asked a frowning satchel depicted on posters plastered around Hamburg. “No thank you.” The sorrowful satchel was the mascot of a citizens’ rebellion against a proposed school restructuring in the city-state. Voters rejected the plan in a referendum on July 18th. The stinging defeat for Hamburg’s government, a novel coalition between the conservative Christian Democratic Union (CDU) and the Green Party, has national consequences, as it may make the CDU-Green alliance a less appealing model for a future federal government. Ole von Beust, Hamburg’s mayor, announced his resignation before the result, saying he had done the job for long enough. He is the sixth CDU premier to leave office this year. Chancellor Angela Merkel, who leads the CDU, must now promote a new generation of leaders. More important are the implications for schools. Hamburg’s plan was a bold attempt to correct a German practice that many think is both unjust and an obstacle to learning. In most states, after just four years of primary school children are streamed into one of several types of secondary school: clever kids attend Gymnasien, middling ones Realschulen and the slowest learners Hauptschulen, which are supposed to prepare them for trades. (A few go to Gesamtschulen, which serve all sorts.) Early selection may be one reason why the educational achievement of German children is linked more closely to that of their parents than in almost any other rich country. Children at the bottom often face low-wage drudgery or the dole. When Desiree Lunsford didn’t know the answer to a question in school, she felt embarrassed. “But now I don’t,” the 10-year-old said. That’s because Lunsford is getting a jump start on the fifth grade. As one of more than 650 elementary school students participating in Red Clay Consolidated School District’s summer enrichment program, she is learning the math and English concepts she would learn in the fall during a 23-day summer course ending Friday. Students are rising third to sixth graders. This is the second year for the program, which has doubled in size and length. The program runs at Marbrook, Baltz and and Warner elementary schools from 8 a.m. to 11:30 a.m. and is open to all Red Clay students. The program is federally funded, with breakfasts and lunches provided through the federal Summer Food Service Program. A team from Penn Manor High School, in Millersville, Pa., beat out student rocketeers from France and the United Kingdom to win the Third Annual Transatlantic Rocketry Challenge Friday in Farnborough, England. Horsforth School, in Leeds, England, placed second, while technical problems grounded the French rocket. “We are so excited that we won,” team member Brendan Stoeckl said in a news release from the Aerospace Industries Association, which sponsors the contest. “We succeeded because of practice, good data analysis and teamwork. Christina Garcia had her heart set on going to the University of Washington in Seattle. But with annual out-of-state tuition topping $25,000, the recent Cedarburg High School graduate and her family calculated it would cost more than $40,000 per year to go to school at her first college choice. In the end, it only made sense to head to another UW — the University of Wisconsin-Madison. That decision came as a pleasant surprise to Garcia’s father, a dentist in suburban Milwaukee, who has been “putting money aside” over the years with the idea of helping his two children get through college. Likewise, Garcia’s grandmother had also been saving. Discipline / Violence, Lifelong Learning, Parenting, School Climate, Student Support, Wellness, What Can I Do? K-12 Tax & Spending Climate: The Democratic Party’s capture by public unions and professional politicians is strangling much of liberalism’s agenda. In the distant future, some U.S. historian in kindergarten today will write about Congressman David Obey’s contribution to the splitting apart of American liberalism’s assumptions about the purpose of government. Mr. Obey of Wisconsin is chairman of the House Appropriations Committee, the spenders. People have said for years that government robs Peter to pay Paul. Now brother is ripping off brother. Mr. Obey plans to send $10 billion to school districts to avoid teacher layoffs and will pay for it in part by taking money from several school reform programs, such as Race to the Top. I have taught at Encinal High School in Alameda since the 1996-97 school year, when I left Oakland following the teacher strike. I left reluctantly, because I loved teaching at Elmhurst Middle School, but like many union reps, I was the subject of illegal disciplinary action following the month-long teacher’s strike and left in disgust. To my delight, I still was able to teach many Oakland students who also left OUSD following the strike, and to work with fine educators who left then, too. It’s estimated that 400 out-of-district students attend Alameda schools. Three decades after the Supreme Court ruled that immigration violations cannot be used as a basis to deny children equal access to a public school education, one in five school districts in New York State is routinely requiring a child’s immigration papers as a prerequisite to enrollment, or asking parents for information that only lawful immigrants can provide. Local school enrollment policies have been in the news recently due to an accused murderer (and apparent illegal immigrant) using a false identity to enroll in the Madison West and Middleton High Schools. The complete 3.5MB PDF report is available here. In the school district where I teach, we do a moderate amount of within-grade-level ability-grouping with our students, particularly in reading and math. Occasionally I hear a teacher bemoan this practice as “tracking,” despite the fact that the groups are rather flexible and, particularly in reading, the students are re-grouped often (every few weeks) according to their learning needs. It is not “tracking” in the way groupings were created decades ago in our district in which students were irreversibly placed into, or rather locked into, a track. These are flexible groupings far more than they are tracks. Ironically, the grade-level, whole-class groupings apparently preferred by these teachers who bemoan ability-grouping are the most restrictive form of tracking, that by age. For a century (-ish), schools have “tracked” students based on when they were born, not based on what they are ready and able to learn. “Born between September 1, 2003, and August 31, 2004? You belong to the Class of 2022.” That is how it works in nearly every school in our country. It’s tracking by age, but no one calls it that. Of course, many teachers, especially those of us in the realm of gifted education, recognize that age-tracking (particularly in the absence of any differentiation) does little to help schools meet the learning needs of gifted and advanced learners who are academically years ahead of their age-peers. The story about Provost Academy and the rise of online learning initiatives in South Carolina should be a pretty good indicator of the benefit that alternative learning methods have for today’s youth. Here is a stretch of text from the story. You can read the whole story online by visiting the site. Everyone has his or her own learning style. Washington’s mother, Alice Peterson, said she knew her daughter was headed down the wrong path. “I might have been in jail and she might have been in the funeral home somewhere,” Peterson said. Instead, the cousins heard about Provost Academy, a free public online high school for South Carolina residents. They meet at Refuge Outreach Ministry in Lake City to take their lessons. Years later, Grace Dunham still remembers a typical sixth-grade day at St. Ann’s School: She played guitar, made papier-mâché aliens for Jupiter’s moon Europa, went to puppetry, had some lunch and then dropped an egg off a balcony for a project that involved creating protective covers to prevent eggs from breaking. She recalls feeling like a very lucky 12-year-old. “It was an amazing feeling,” she said. But around the time she was figuring out how to build a better eggshell, the school’s board was coming to the conclusion that what St. Ann’s possessed in creativity, it lacked in professional management. It ushered out its founding headmaster and defining figure, Stanley Bosworth, and brought in new help. Most of the great iterative tech changes to education have happened in higher education. But those changes are starting to drift down into K12, and take on their own shape and meaning. Here is a list we found online that charts those changes and pinpoints the evolutionary steps you should be looking to track to stay ahead of the curve. The clearest example of iterative change is the rise of mobile computing tied to the cloud. I have taken a few paragraphs from a recent report to show you how accelerated the changes will be. In the past two years, netbooks have arrived on the scene, but their sales are already growing more than 200 percent per year. K-12 schools adopt them at a higher rate because many of them provide devices for their students. Netbook trends include 10-inch screens, faster processors, longer battery life and built-in wireless wide area networks. An overhaul in the admissions process for Chicago’s selective public schools had little impact on overall diversity, but individual buildings show much more variance — in some cases growing more segregated for the 2010-11 school year, CPS officials said Tuesday. Chicago Public Schools chief Ron Huberman cautioned that the data are very preliminary and could change when the school year starts. Among other things, a budget crisis may force cuts in transportation to and from these schools, which could prompt enrollment changes. He conceded that some schools are losing diversity. California typically lands at or near the bottom in virtually every measure of public school performance nationally, but the academic content taught to the state’s schoolchildren is second to none, according to a study released Tuesday. That status has left the Golden State with a conundrum. To be more competitive for federal Race to the Top funds, the state must adopt common standards in English, math and other subjects to be in sync with most other states. But that would mean replacing the academic standards that were recognized in the study conducted by the Thomas B. Fordham Institute, a think tank based in Ohio. Critics are concerned the national standards could dumb down California classrooms, discarding the state’s superior academic framework adopted 13 years ago for students from kindergarten through high school. Poets writing in English have six centuries’ worth of forms at their disposal. During the Renaissance, Shakespeare and Milton made blank verse (unrhymed iambic pentameter) the standard mode for narrative and dramatic verse, while in the eighteenth century Dryden and Pope preferred the urbane rhythms of the heroic couplet. Then there are the adopted forms, not quite domesticated from their French or Italian originals: rhyme royal, sestinas, triolets. Recently, American poets have become fond of the pantoum, an originally Malay form that involves a cyclical repetition of lines. But none of these is as vigorous, even in the generally lawless and anti-formal world of contemporary American poetry, as that most conventional and classical of forms, the sonnet. Reading and math learning goals for Hawaii public schools are “mediocre” and “often vague,” says a new national report that gives the state a “C” for its educational standards. But the report points out that when Hawaii adopts common national standards in the 2011 school year, its standards will improve. The report gives the national standards a B-plus for English and an A-minus for math. The state Department of Education said yesterday it agreed with the report’s findings.